Sludge is a solid precipitation material produced by water and sewage treatment processes. 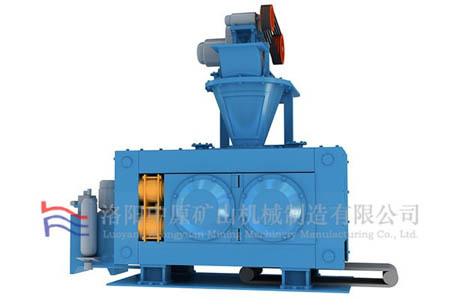 The sludge briquetting machine is mainly used for the ball making of sludge, directly into the furnace for smelting, to increase the added value, and also has a good forming effect on many types of materials such as coal powder, clay and carbon powder. The sludge ball press can be used for pressing a series of materials such as sludge and clay. According to the production capacity of the sludge ball press, it can be divided into different models. The specification of the forming roller diameter and the roller width are the main factors determining the production capacity. Pay special attention when purchasing. 1. The feeding part is mainly to realize the quantitative feeding to ensure that the material evenly enters into the roller area. If the feeding amount is too large, the feeding device is overloaded; if the feeding amount is too small, the ball cannot be formed. Therefore, the skilled operation technique is an important condition for ensuring the normal operation. 2, The main drive system is motor – coupling – double output shaft reducer – drum gear coupling – pressure roller. 3. The molding part mainly refers to the main part, and the core part is the pressure rollers. The machine can adjust the pressure according to the requirements of the pressure ball density, and the production is flexible. The sludge ball press has the characteristics of good forming effect, durability and simple maintenance. It is a specially designed ball press equipment to meet the requirements of current environmental protection and energy-saving.